Lift-Rite's® standard pallet trucks meet the needs of most modern materials handling environments. These pallet trucks provide operator productivity with great performance and reliability. Our pallet trucks are ideal for warehouses, truck trailers, factories, retail, or transportation environments. If you want dependability, you want a Lift-Rite® pallet truck. Ergonomic handle - The contoured handle loop and coated control lever achieve operator comfort and superior load maneuverability. Articulating Steer wheels - Imperfect or uneven floors are negotiated easily with articulating steer wheels maintaining proper load balance. 5,500 lb. Capacity - A robust chassis design and high performance hydraulic pump provide ample load capacity for the heaviest applications. Effortless pallet entry/ exit - Heavy-duty pallet slides and bushing packed exit rollers form a perfect combination for smooth transition in and out of many different pallet types. Optional skid adapter, backrest, and brake assembly are available. See Options for Standard Pallet Trucks. Special Widths and Lengths are available. 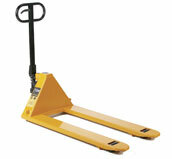 The above pallet trucks are equipped with black nylon wheels and rollers.